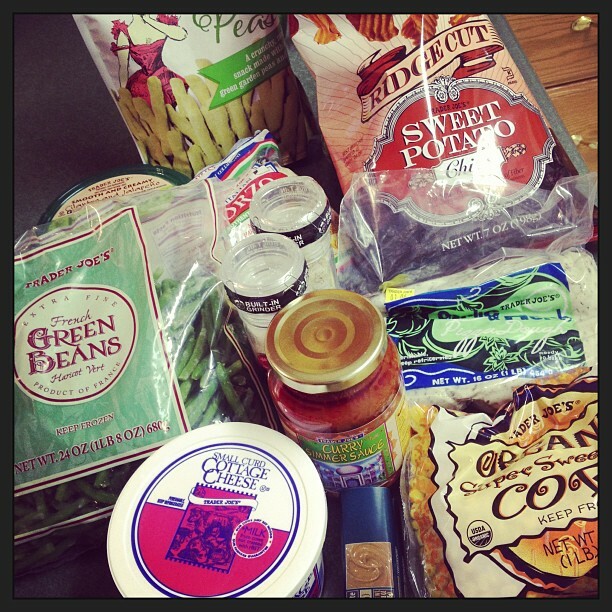 We did much better at Trader Joe's this time and we were in love with almost all that we bought! Apparently it takes some practice to find the right products! I would have given these 5 stars, but they were definitely "crispy" if you know what I mean. Kind of hard to break down, but they had a fun flavor. This corn is great! The kernals are a little large, but I would definitely buy it again. I used them in this soup! I've heard rave reviews about these chocolate bars and was not disappointed! If you don't know what Speculoos is, it's Trader Joe's Cookie Butter. So therefore, these are totally a must-have item. Big fan of this grinder! I think it was only $2 and it includes salt, garlic, parsley and onion flakes that you hand grind and pour out. So easy to use and such a fun idea! Of course I loved this grinder as well. It's also my first container of sea salt in my house and I'm in love! Perfect to sprinkle on top of homemade soft pretzels! I fell in love with this dough! I usually always make my own, but this was only a little over a dollar and had such a great flavor. It was really pliable and easy to roll out. It baked well, too. I used it in this recipe here. These weren't a favorite. It was kind of like eating air, but I did finish them off. Just not enough flavor. I love these beans as opposed to your standard run-of-the-mill frozen green beans that just don't cut it. Simply boil or steam and mix with a little butter, parmesan, salt and pepper for a perfect side! This was my first time using orzo and I thought it was a great substitute for rice. I used it in a broccoli cheese orzo recipe coming soon to the blog! I am definitely a newbie to curry and I totally loved this sauce! It was the perfect amount to mix with 2 shredded chicken breasts and 1 cup of water over rice. (Instructions on the label.) It was slightly sweet, flavorful and made for a very easy weeknight meal. The best part of this trip was that our total was only a little over $20! We couldn't believe it! Definitely a winning night at Trader Joe's. I think we may know be addicted!